And....this season of The (Dystopian-ish) Bachelor is now concluded. 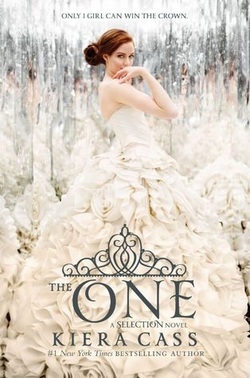 I finally have my answer...Aspen or Maxon? Maxon or Aspen? Which dude does America end up with? And now I know. But you shall find no spoilers here...and don't go peeking at the end of the book to find out, either - it will definitely take a lot out of the story ('cause let's face it...the decision between the two is pretty much the whole story). So, other than finally knowing who America ends up with...this was an ok book. Not my favorite of the three...I think I enjoyed the first book the best. I enjoyed the different characters floating in and out of the first installment. This final installment is (obviously) focused on wrapping things up and bringing the story to its conclusion. As it should. But there were parts that seemed flatter than I would have liked...lots of talking and whining (if I had a nickel for every time Maxon whined/wavered/wimpered, I would be a rich lady. Or I'd have a few bucks at any rate...enough for a frappucino at least...). Not as much plot movement in my opinion. Oh, a lot happens...it just wasn't as layered as maybe the first one was. The One is still immensely readable and absorbing, just as the first two were. I enjoy Cass's writing style - it makes for a quick, fun read. I found myself wanting to know a little bit more about the conclusion than was written. The conclusion was satisfying, but I think it could have been fleshed out a bit more (especially with certain characters) to where the ending seemed all the more complete than it already was...and maybe tie up a loose end or two. I really can't go into detail lest I let something slip. One thing I wish was tackled more in the trilogy as a whole (and definitely in the final installment) was the issue with the Northern and Southern Rebels. The potential was there to really delve into the worldbuilding and the politics, but we were given just enough to make it a plot point and then we moved back to the Selection. I understand...the trilogy is about the Selection, not the Rebels...but I think it could have added more depth to the story and given it an actual dystopian feel. As it stands, it's categorized as dystopian fiction, but without an emphasis on building the dystopian world it really just turns into a literary version of the Bachelor. Which I am obviously ok with...because I devoured these three books. But still...the world building could have been more structured and detailed. So, four stars for this one.